Revered author and Chicago native Sandra Cisneros, whose works have inspired legions of fans around the globe, returned to her roots earlier this month for the renaming of one of United Neighborhood Organization’s (UNO) newest facilities after the famed author. “It is quite a humbling experience,” said Cisneros. And although Cisneros has sold millions of books worldwide, has traveled to the most exotic places in the world, and met with world leaders, Cisneros still manages to become overwhelmed when faced in front of the young leaders of tomorrow. “We need to teach children the importance of education. I have to acknowledge these students and their accomplishments and the accomplishments of their parents,” said Cisneros. 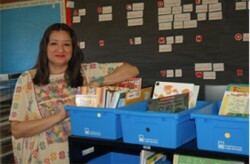 “Nothing makes me happier than to see young Latinos and Latinas in school.” Lawndale Bilingual Newspaper had the pleasure of speaking with Cisneros, who shared her modest take on her accomplishments, the legacy of her iconic work, ‘The House on Mango Street,’ and how is she redefining her relationship with her beloved Chicago. Sandra Cisneros: I think the first [emotion] is one of astonishment because any time there is an accomplishment, for me, in Chicago I just feel absolutely astonished. I’m 57 years-old, I used to wait for these buses and take the train. So anytime I come back to Chicago, in any context, it’s a measurement of where I come from and where I am now. So coming into a situation like this, first thing I always say is, ‘and I’m not even dead.’ [Laughs] These are the kinds of accomplishments you get posthumously. Most writers wouldn’t get this kind of recognition in their lifetime; some never get to meet their audience or see the rewards of their labor. So I feel very lucky. I feel very blessed. I really feel the spirit of my mother and father and my ancestors, here. I’m very proud. No, because I usually come back as a daughter or cousin. And since my mother and father have gone, I feel rather orphaned from Chicago. Coming back with having both parents gone is a little strange. I’ll be coming in the autumn with a new book about being orphaned, so that’ll be an experience. I come back as an author now. I think since my mother’s death five years ago, I kind of lost a root. A very profound root has been severed and I’m still trying to redefine that relationship with Chicago. I’m just an author and in these times an author’s celebrity is rather small than people on television with big butts, you know. They are much more important than I’ll ever be, unfortunately, [laughs] but it’s good to be humbled by that. But it’s lovely to realize, ‘hey I’m an author,’ it’s something I never dreamed of as a little girl. I really hope that people recognize that this is a story that is happening in wherever street that they live on. That everybody knows a house, and people in it, and love people on that block. And they, like Esperanza, will do some work for those they love. I want everyone to, whether they live in south Texas, or Buenos Aires, or if they live in Kyoto, understand that ‘The House on Mango Street’ is there address and they have an obligation to help to make change. I think it’s very important for all the little girls, especially, to understand they have to go to school. The more school the better because once you have an education no one can take that away from you. That was something my mother and father taught us, my six brothers and me. It was always to go to school so that we would be able to work with our minds, not our hands. My mother didn’t care what we studied so long as we went to school. It’s important that kids learn that now, when they are very little. Because, to me, my dream of becoming a writer was born in the public library in middle school.